The Bundaberg Health Services Foundation’s Volunteer Program gives members of the community who wish to donate their time to assist the organisation an avenue to do so. Volunteer Barb Hargraves with Library staff in Cafe 641. We see volunteers as being a very valuable members of our society and have developed our volunteer program in such a way that volunteers are not only valued but given the opportunity to grow with the organisation. 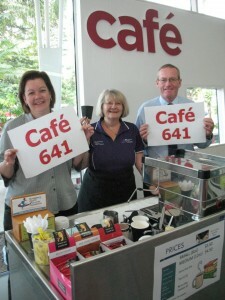 In February 2010 the Foundation established a barista-style coffee bar in the Bundaberg Hospital staff dining room for use by staff and it operated successfully thanks to a willing band of volunteers up until July 2014 when the Foundation took over the cafe lease at Bundaberg Hospital. Our volunteers now operate a similar barista style cafe at the Bundaberg Regional Library – Cafe 641 – Monday to Friday from 9.30am to noon. They also assist in a trolley service to various wards at Bundaberg Hospital selling a range of good from newspapers to gifts, toiletries and magazines. You don’t have to be a doctor or nurse to be part of the team that saves and improves the lives of patients – these volunteers are making a great contribution by learning the art of barista style coffee making and giving some of their time to the Foundation. Barista Training Courses are held regularly and you can then volunteer on a roster basis. If you would like to become a volunteer please telephone the office today on 4150 2863. 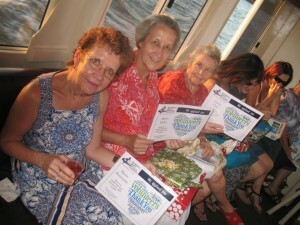 Our volunteers enjoy a yearly Christmas break-up and badges are given for 3, 5, 7 and 10 years of service.